Happy Spring y'all! 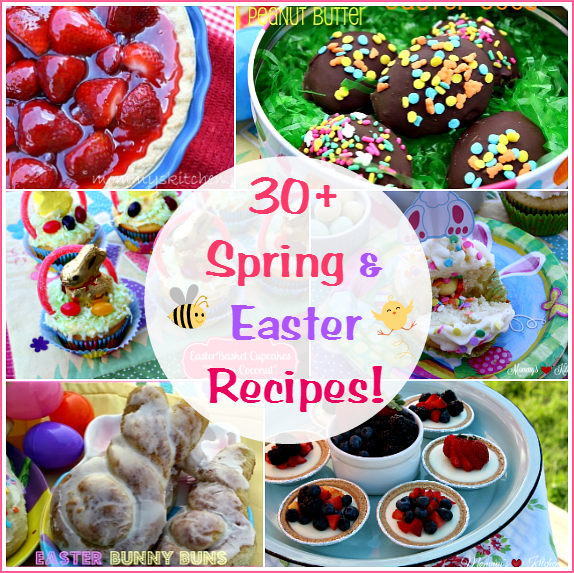 Fall is my favorite season, but spring comes in a close second. I don't care for all the spring storms that go along with Texas territory, but I do love all the vibrant colors, the flowers popping back up, cool days, and getting everything fresh and clean from winter. This year I really want to work on brightening up our front entryway and back yard with lots of different colors. It's amazing how colors can change your mood in an instant. I love potted plants, so when Walmart asked me to spruce up my outdoor area with items from their garden department I knew I wanted to do something fun and different. Our front porch needed one more item to pull it all together, so I settled on making a homemade hanging planter. 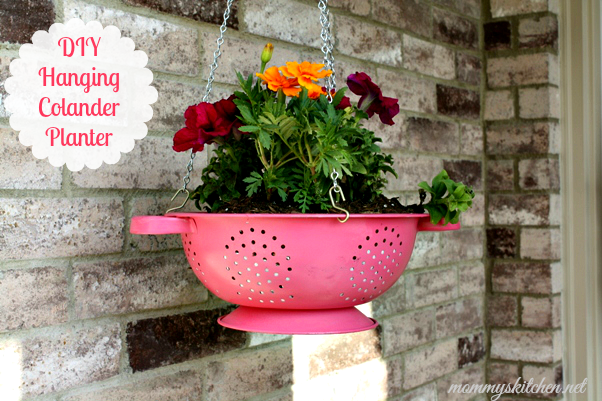 I love the country look, so I chose to create a DIY Hanging Colander Planter. I saw this idea a couple years back, but they used a colander from a garage sale. I didn't have a spare colander laying around, so off to Walmart I went to purchased a new one. With a few simple items and some paint before I knew it I had exactly what I wanted. I picked out a bright berry pink to color the colander and chose a mix of petunias and marigolds which paired perfectly inside my planter. 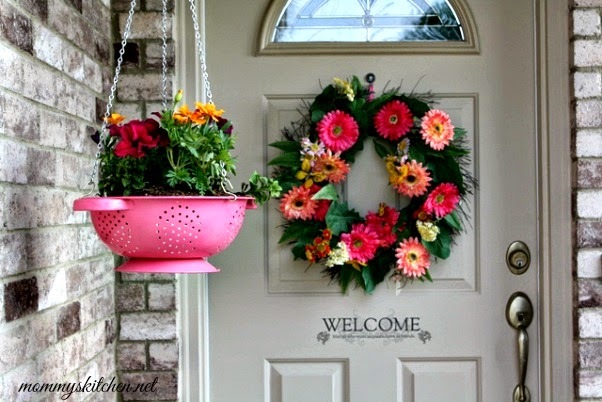 I love the pop of color and the pink really brings out the colors on my door wreath. I have fallen in love with my new planter, and it fits perfectly on my front porch. I'm so glad I finally got around to making this project. 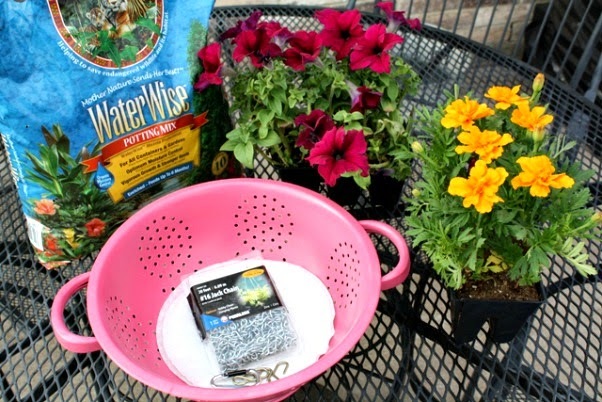 Lets get started and I will show you how to make a colander planter for your patio or backyard. First you will need a new or re purposed colander. I did not have a old colander, so I needed to purchase a new one. I found a stainless steel colander at Walmart for $6.64. If you do not want to paint your colander you can just use it as is for a shiny look. To paint the colander you will need to do a bit of prep work first. Since it's a metal colander you will need to wipe the surface first with white vinegar. The vinegar cleans the surface, removes any oily residue, and makes paint peeling less likely. A store bought Liquid deglosser will also work, but vinegar is cheaper and doesn't have all the chemicals. Let the colander completely dry before priming. Primers act as a bridge between the material and the paint, as well as helping the paint adhere to the colander. I sprayed one coat of Rust-Oleum Ultra Cover 2X Primer. Make sure to let the primer dry according to the directions on the can (I let the primer dry about 2 hours before painting). Once the primer is dry you can paint the colander with a color of your choosing. I picked Rust-oleum's American Accents Ultra Cover in Berry Pink. Since it is 2X the coverage I only added one coat of paint. Let the colander completely dry and finish with a clear coat spray to seal and protect the paint. Let the colander dry overnight before planting. Now it's time to start assembling our planter. 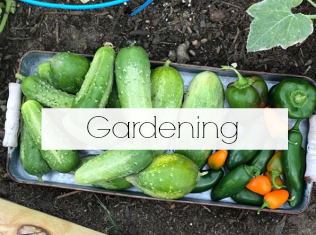 You will need potting soil, flowers, plants or a few herbs, coffee filters or burlap fabric, chain or twine and flower pot hooks. I chose to use flowers in my planter, so I picked out some yellow marigolds and purple colored petunias. You can also do all plants if you prefer. Walmarts Garden Center has an excellent selection of plants, flowers and herbs to choose from, so you can't go wrong. Texas heat can be hot and unbearable, so petunias, marigolds, lantana and begonias seem to tolerate the heat really well, so that's what I went with. 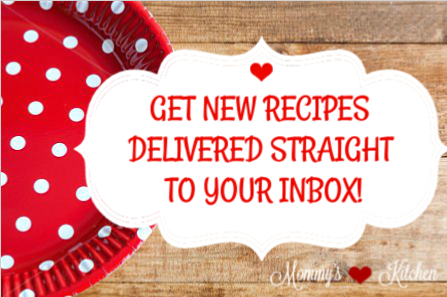 Line the coffee filters on the inside of the colander or cut a circle out of a piece of burlap fabric. The coffee filters or burlap will help hold the soil in the colander while still allowing for adequate drainage. Once the filters are in place add about 1 inch of potting soil over the coffee filters. Now you can start adding flowers or plants, and then cover with more soil to hide the coffee filters. You can place your new planter on a table or you can choose to hang the colander with flower pot hooks and a chain or twine to create a hanging plant option. 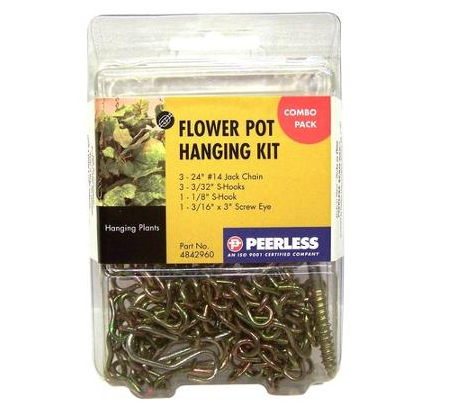 The garden department has a flower pot hanging kit for $3.97. They were out of them at my local Walmart, so I used jack chain (hardware department), S-hooks and a single all purpose hook to hang the planter. I found the jack chain and the hooks back in the hardware department. You can also use twine if you want to go that route instead of chain and tie it from the colander handles. Using wire cutters, cut the chain to the desired length you want. I used 3 pieces of chain and 3 hooks. I placed two chains in the back of the planter and one in the front. Gather all the chain together and slide into the last S hook (flower pot hook) and then attach to a small all purpose hook and hang. You can hang your new colander planter on a porch, patio or on a shepherds hood in your flower garden. For fun I also added a .97 decorative solar light that I found in the Garden Center to light up my planter at night. Total cost for this spring gardening project was approximately $27. Now my front entry way in complete! Also pictured is my DIY Terra Cotta Tiered Planter that I made last spring on the bottom left, and still looks as good as new. Stop by Walmarts Garden Center for your next spring project. To paint the colander you will need to do a bit of prep work first. Since it's a metal colander you will need to wipe the surface first with white vinegar or use a store bought deglosser. The vinegar cleans the surface, removes any oily residue, and makes paint peeling less likely. Let the colander completely dry before priming. Now it's time to add the primer. Spray one coat of primer all over the colander (inside & out). Make sure to let the primer dry according to the directions on the can (I let the primer dry about 2 hours before painting). Once the primer is dry you can paint the colander with a color of your choosing. I used Rustoleums 2x the coverage paint, so I only added one coat. Let the colander completely dry (per directions on paint can) and finish with a clear coat spray to seal and protect the paint. Let the colander dry overnight before planting. Line the inside of the colander with coffee filters or cut a circle out of a piece of burlap fabric. The coffee filters or burlap will help hold the soil in the colander while still allowing for adequate drainage. 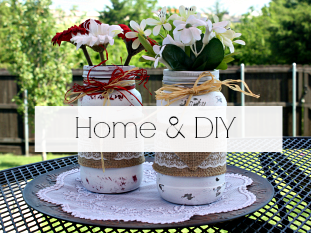 You can also add rocks as well on top of the burlap or filters, but that's optional. Once the filters are in place add about 1 inch of potting soil over the coffee filters. Now you can start adding flowers or plants, and then cover with more soil to hide the coffee filters. Don't forget to water your plants or flowers. You can place your new planter on a table or you can choose to hang the colander (see directions above) with flower pot hooks and a chain or twine to create a hanging plant option. Oh, I love your colander planter. It looks so pretty hanging on your front porch and cool and clever idea adding a solar light. All your beautiful painted pots make for a welcoming entrance. Thank you Colleen! I love the solar light and glad I thought of it. As always thank you for stopping by. Beautiful entrance way. Very inviting. 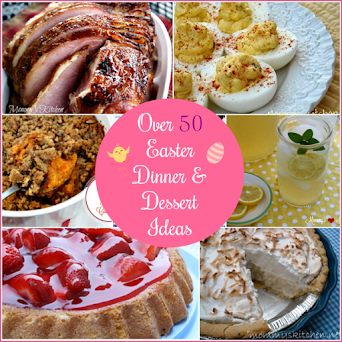 I just may stop in for tea someday. Teehee! 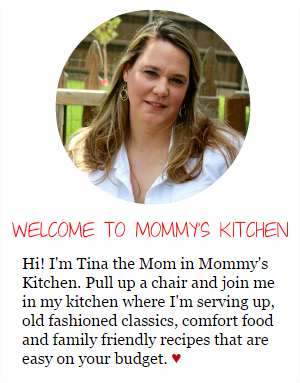 Tina, I love this!! Can't wait to try this. I have a shepherds hook waiting for this. Thanks for such a great idea! Thank you so much for the nice comments. I just painted my front door and added the vinyl quote, so it just needed a bit of color and I think I found it with this beautiful planter. If y'all make it send me photos. Oh my gosh...I love it. I have seen some on PINTEREST and wanted to do one. Thanks for the talking me through the steps. I think for my area I will hang with twine. I might have to replace every year but that will be ok. Thanks for sharing. 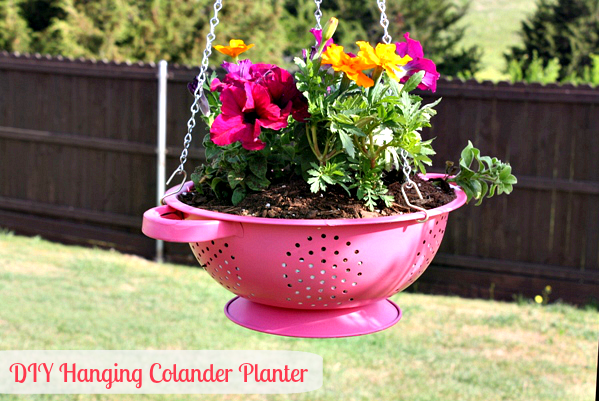 What a cute idea and I love the pink colander! I made this planter this weekend with my son. My mothers day present. I purchased hanging pot chain and hook for 1.33 in the garden center. I had to bend the s hooks out a little since they are smaller. It works wonderful ! Thanks so much for the neat idea! I went out the day you posted with three of my children, we searched through a goodwill store and found 3 unique colanders, we then went and bought a pretty blue spray paint. It was a fun challenge to then paint the colanders without Grandma seeing (she lives with us). We then spent another day going to the store and picking out flowers and hanging post for the fence. She LOVED them and the children were so happy to have a part in making them. Thanks for the lovely idea! i tried this but the colander was SO rough from overspray... any recommendations on how to keep it smoother? he only thing I can think of is that you're spraying too much paint. You need to spray with light strokes and don't place the paint can too too close to the colandor. I used one coat of primer and one coat of Rustoleums 2XX coverage paint. 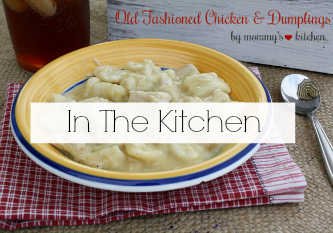 I'm so glad it turned out and yes light strokes away from the colander. I am so in love with mine. BEAUTIFUL! I loved the colorful display. Giving me incentive to get my place cleaned up of all the recycling bags/boxes! While I'm cleaning out my apt. I can still enjoy a hanging pot on my front porch or sitting on the large wooden spool table. I've desired to have BEAUTY around me for years. I've been living in piles for so long, I don't know anything else. But my father always had gorgeous flowers planted around the house and pole beans along the other side and a small garden while I was growing up! Being on a budget, (who isn't) I already have potting soil (never opened) can I use that or does it have to be fresh/certain type? I really like the pink colander but I don't want to fool with paint just yet. I would probably leave silver. Does it hurt the plants to leave it stainless steel? Will it hurt any one's eye's with the sun reflecting off of it? Will the heat of the sun cause it to get too hot if out in the sun? I'm going to look for ideas for cleaning/de-cluttering. Got any? Great idea. I just wanted to know I shared this on my page. Stop by and check it out. Hi! I realize this comment is a couple of years late... But did you paint the doormat? I love it! No, I got the door mat at Kirklands.